A former Olympic gymnast and her sister, who also competed on the national team, filed lawsuits Monday that claim USA Gymnastics enabled and failed to prevent sexual abuse by the team's former doctor, Larry Nassar. The U.S. Olympic Committee and Nassar are also named as defendants in the civil suits filed in Los Angeles by Tasha and Jordan Schwikert. The organizations knew "or should have known of Nassar's sexual abuse and could have prevented it by taking sexual abuse allegations seriously and maintaining a culture of accountability and transparency," the two complaints said. USA Gymnastics said in a statement that it doesn't comment on pending litigation. "The organization has undergone significant reforms in the wake of his horrific acts that have impacted our athletes and community forever," the statement said. The USOC didn't immediately respond to an email seeking comment. 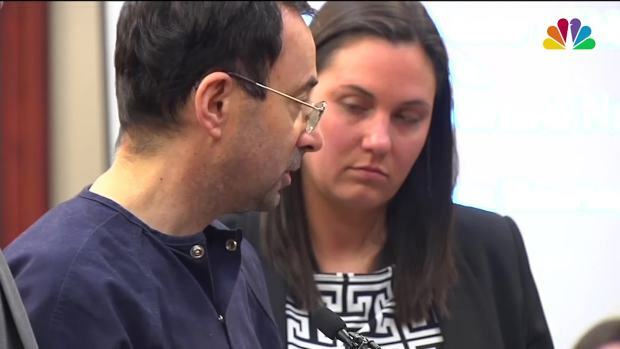 Nassar is serving decades in prison after hundreds of girls and women said he sexually abused them under the guise of medical treatment when he worked for Michigan State University and Indiana-based USA Gymnastics, which trains Olympians. The sisters both claim Nassar assaulted them during their time on the national team. Officials at USA Gymnastics were "out of touch," leading to a toxic culture that "allowed this child molester to get away with abusing children for decades," Tasha Schwikert, 33, said at a news conference. Tasha Schwikert, who earned bronze at the 2000 Summer Games in Australia, works as a lawyer. Jordan Schwikert, 32, was an elite college gymnast and is now a gymnastics coach. They both live in Las Vegas. The lawsuits seek unspecified damages under the Racketeer Influenced and Corrupt Organizations Act and allege the defendants engaged in a pattern of sexual exploitation, abuse, and trafficking of minors and conspiracy to commit such acts. USA Gymnastics President Kerry Perry resigned last month and was the latest person to face fallout in the wake of the Nassar allegations. Numerous other people have been criminally charged, fired or forced out of their jobs during the investigations into Nassar.